As long as there have been video games, there have been puzzle games. After all, who doesn’t remember games like Tetris, Majong, that bomb game (that I always lost at), and other classic puzzlers like Sudoku, crosswords, and even hangman? With the technology that is available today, you see a lot of puzzlers available on iTunes—and we aren’t talking about the Candy Crush type games either. Sure, there are a wide variety of these match-three type games (it seems like there is a new one popping up with every big movie that comes out, most notably Frozen Free Fall and the Maleficent version) and the bubble games like Witch Bubble Saga; but there are some equally interesting puzzle games that do not follow these prototypes. What Are Some Different Puzzle Games Available? When it comes to puzzlers, there are actually quite a few different types of games that can fall under this category. Most notably, you have the match-three games like Candy Crush or Collapse, but you also have hidden object games. With these games you are given a list of items that you have to find within a certain amount of time. These can be a little cumbersome for iPhone users because the puzzle screen is jam packed with stuff. I recommend you attempt the hidden object games on an iPad because of the larger screen space. 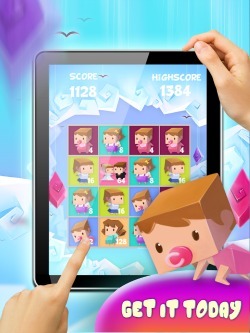 Classic puzzles like crossword puzzles, Sudoko, and even trivia games are quite popular on iTunes. These calming games are a nice way to wind down after a stressful day. Some of these games also give you the ability to play against your friends. Other puzzlers that make it fun to play against your friends are the “with friends” series that you may see becoming popular. These games include Words with Friends, Matching with Friends, Chess With Friends and more. These types of games are created by the Zynga group that are particularly known for the “Ville” games you see on Facebook. Ah, but the genre goes even further than the casual type games. Puzzlers that actually make you think, like logic based games and jigsaw games, can be used to help sharpen your cognitive abilities, your memory, and test your IQ . Of course, there is no real proof that these types of games have any merit when it comes to sharpening your brain—they are still fun to play. I guess in a way all video games, regardless of platform, can be seen as a puzzle. No matter what you are playing, your brain is being tested. You are using some kind of problem solving technique; whether you are trying to get the biggest match-three combination or you are trying to blast away the zombies before they eat your brain. Whoever said these games are not worth the time and effort it takes to pay for and download the game clearly has no idea what they are talking about. In fact, puzzle games may be one of the most underrated games available. If you’re looking to sharpen your brain and kill some time, these games are definitely the way to go. Click here to go to the Apple games homepage. 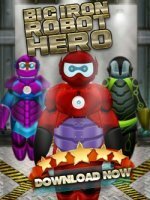 Big Hero 6 Inspired game, Big Iron Robot Hero is a dress up game with a wide variety of cosmetic choices and built-in social sharing system. 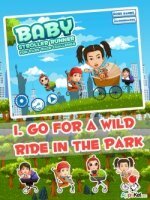 Baby Stroller Runner offers fast-paced gameplay and tons of content to unlock. For sure you'll have plenty of fun watching your baby zoom around the park! 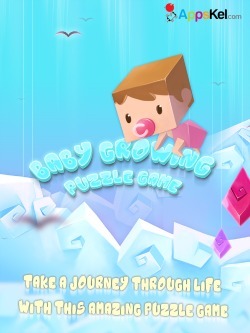 Baby Growing Puzzle Game is a new form of the 2048 game! The addicting numbers game everybody loves - but this time, with personality!